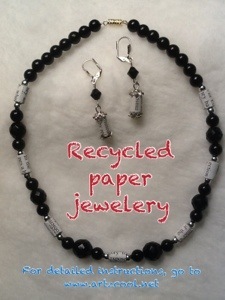 Paper beads | ARTZCOOL'S BLOG! 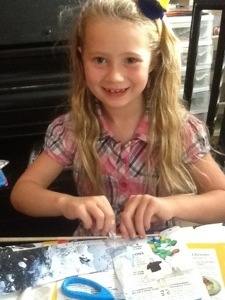 Whew, the first couple of weeks of school are almost done! I know those of you who are not teachers don’t feel sorry for us having two months off…but the first couple of weeks are tough! The first weekend after school ended, we had a baseball tournament, soccer finals, johns ultimate tournament, and a cancer walk. This week, i have been home the last couple nights after nine because i have been in training for brownies… So needless to say, i haven’t had the time or motivation to do anything crafty, let alone write about them. 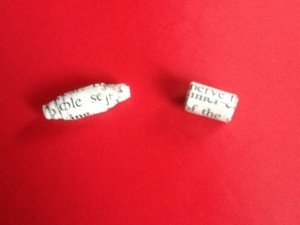 But, i am a couple projects behind, so i will tell you about another of my encyclopedia art projects that I made before school started…A few days ago, i posted a paper craft where I made beads out of recycled encyclopedias. Now, they need to be made into something! 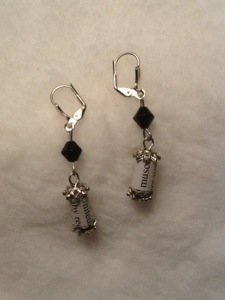 So, I am making them into a pair of earrings and a necklace. 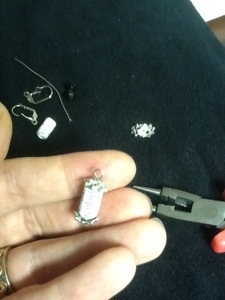 Thread the beads on the eye pin. 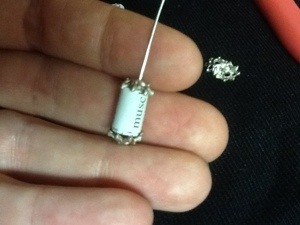 I put a bead cap, then the bead, then another bead cap. 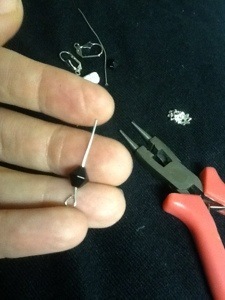 Then, cut off the head pin about 1cm away from where the beads end. 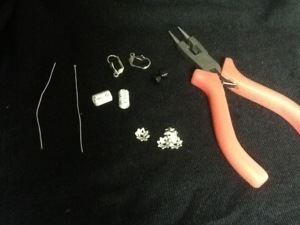 Then, use the pliers to bend the wire into a loop. 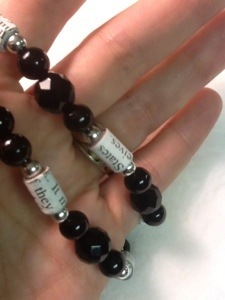 I used the extra wire that i cut off, to add another black bead. 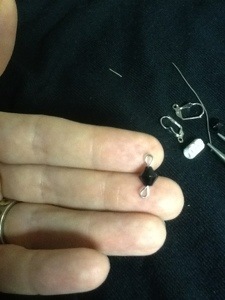 I bent a loop with the pliers, then threaded the bead on, and bent another loop. To make a necklace, start by deciding on your design. I like to use a bead board to lay it out first, you can also use a piece of fabric, which works well to stop the beads from rolling all over the place. Cut the tigers tail wire to a bit longer than you want your necklace to be. 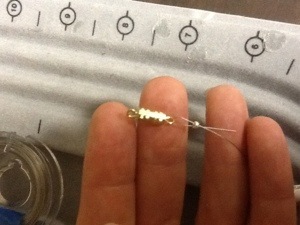 Then thread the tigers tail wire through a crimp, then the clasp, then back through the crimp. 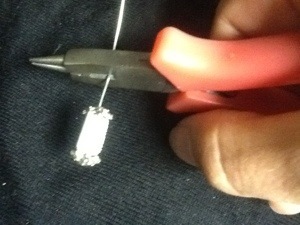 Use a pair of pliers to squeeze the crimp closed to hold the clasp in place. 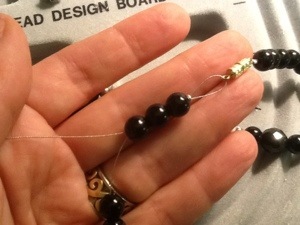 Then, thread on all of the beads, add another crimp, thread it through the clasp and back through the crimp again, and pull tight. 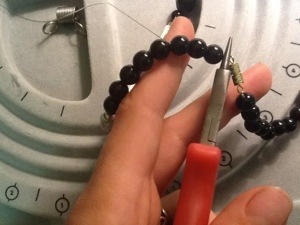 I like to thread the rest of the wire back through a few of the beads rather than cut the wire off. 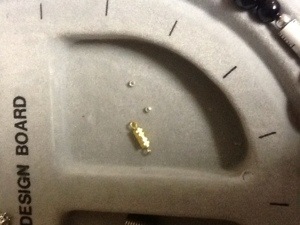 Then, squeeze the crimp shut, and you are done! I used to make these paper beads as a kid, so i thought i would try them out again as another project for my encyclopedias. 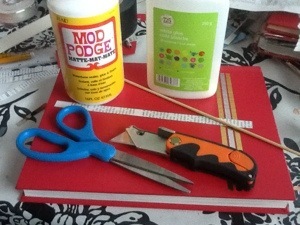 To make the beads, you need mod podge glue or white glue, paper, and a bbq skewer, and scissors or a knife. 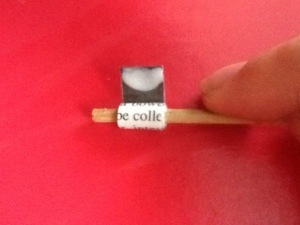 First cut the paper into strips. I decided to cut the all of the strips out of black and white text. But, cutting them out of coloured paper and text is really pretty too. 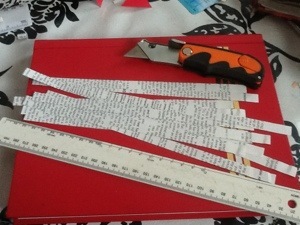 I used a ruler and exacto knife, but cutting with a pair of scissors is fine too, just try to keep your lines straight. You might even want to draw where you are going to cut with a ruler. I also decided to cut them an even width. 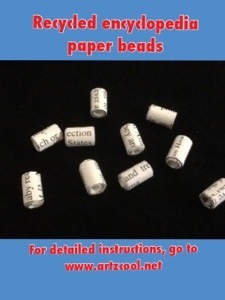 If you taper the width of the paper you will get a bead that looks more like the bead on the left side, which looks nice if you are using coloured paper. If you cut the strips straight, they will look more like the bead on the right. 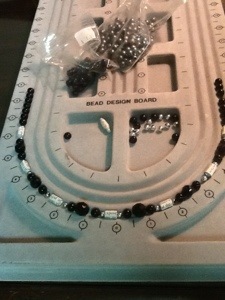 I am going to try making the straight cut beads. And continue rolling until the whole paper is wrapped. 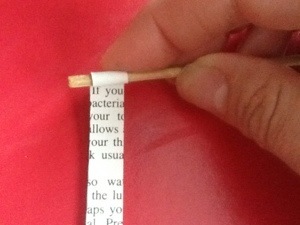 I like to stop just before the end and add a touch more glue to hold the end so it doesn’t unroll. At this point they are cute, but wait until you see them as part of a necklace and earrings!